Archangel Ariel is instrumental in helping you to develop, ground and manifest your ideas, nurturing your creative side. Archangel Ariel combines the energies of Archangel Raphael and Archangel Uriel to bring you healing to whatever blocks your creativity. Archangel Ariel will help you let go of any fears of failure or not being good enough by opening the third eye to developing your intuitive and psychic awareness. Often seen as the feminine energy of the Archangel Uriel. Archangel Ariel is instrumental in helping you to develop, ground and manifest your ideas, nurturing your creative side. Archangel Ariel combines the energies of Archangel Raphael and Archangel Uriel to bring you healing to whatever blocks your creativity. Archangel Ariel will help you let go of any fears of failure or not being good enough by opening the third eye to developing your intuitive and psychic awareness. Archangel Ariel connects you to your soul through the multi-dimensional plane as well as protecting the elemental kingdom. 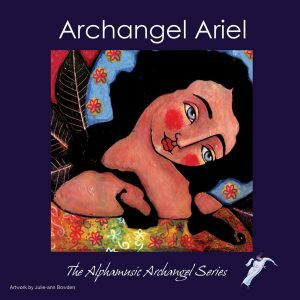 Because Archangel Ariel represents both earth and air elements, Archangel Ariel is able to combine them and facilitate real creative change in your life. As guardian of the Elemental Kingdom, those who have a strong affinity with mystical energies like, fairies, unicorns, tree spirits and so on can really benefit from Archangel Ariel’s influence in their lives. There are sounds that really do elevate our spirit. As a student and teacher of yoga and esoteric meditation I love chanting for this reason. However, in our often secular world, it’s sometimes not appropriate to use mantras. In these situations I turn to Alphamusic because it is the only music I know that has a similar purity. It is wonderful for calming the mind and relaxing the body. I’ve been using Alphamusic cds for many years. When I teach yoga or meditation I often use them before the class starts (to help students settle down) or for the relaxation at the end. As a counsellor I sometimes play them in the background for myself in between clients (to help refresh), or occasionally for a client if they are waiting for me to be free. If my wife wants music to help her sleep it’s the first thing she reaches for.